I know, I know…the blog has been mighty quiet since that last post on October 10th. I’ve been meaning to post more often, seeing as how it’s Socktoberfest and all, but I wound up with a few outside influences making it difficult to post. For anyone who tried to access the blog over the past month to find it missing, or redirecting weirdly…that’s one of those influences. My web host was doing some behind-the-scenes work and had things jumping through the wrong hoops for a few days. Since I generally tend to encourage my host in his technical peccadilloes, I really can’t complain very much or very loudly. It’s a small price to pay for using his monthly bandwidth! The good news is that I was keeping track of my knitting progress over on Ravelry, so all I need to do is refer to those notes for this post. Booyeah! 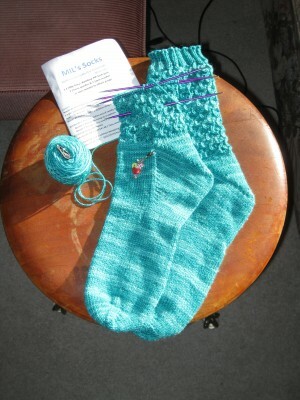 To make a long story a little less long, I finished all but the grafting on the 28:06:42:12 socks, and set them aside. Then I cast on for a pair of Sleepy Hollow socks by Lori Law…at least, I tried to. 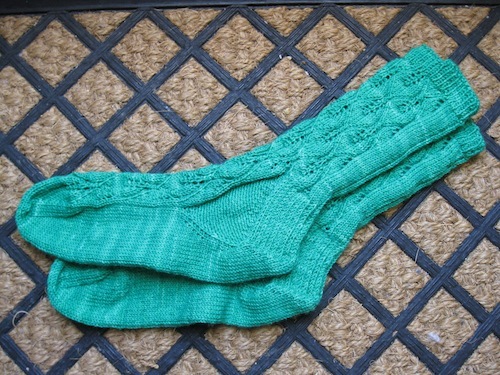 I had this lovely green Koigu that I wanted to use, but 100g of Koigu makes for a pretty small pair of socks. 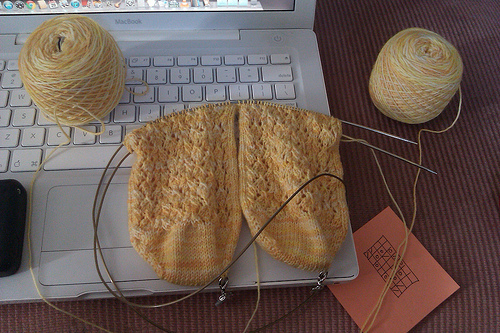 I usually make my Koigu socks from the toe-up, just so I can get what I need out of it. After hemming and hawing over it, I finally cast on with the Koigu in the medium size. Picked up this pattern awhile back, but I’ve never managed to get the sizing right. 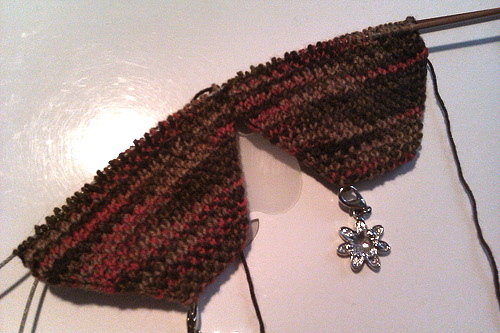 Not sure that the Koigu is going to be enough yardage, so cast on another sock in the Cascade Heritage. I’m rather liking the blues in the Cascade…when I think of Sleepy Hollow, I don’t think of the lush green of the Koigu, but dusky shadows, and twilight. 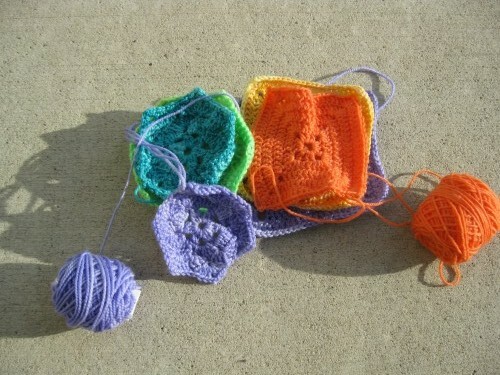 So I went ahead and started knitting away with the Koigu. Because I’m a glutton for punishment. I’ve got a sock that may fit a slender-ankled size 9 person. It sure won’t fit me, with my weighty size 9.5/10 feet and thick ankles. And in a way, there’s no real urge to finish these at the moment if I’m not going to fit them. I had a wave of pure selfishness. I’m thinking that if I could scare up another (third) ball of the Koigu, I could just do a larger version. I’m thinking this may go on hold until I decide whether to put these in the “for someone the right size” box, or I can find a ball of the same yarn, possibly at Pudding. Argh. Okay. So after much deliberation, I decided to take a bit of a leap and went down to The Stash and found a ball of Araucania Ranco in a dark purple. I cast it on and am currently at the point where I’m done the leg and about to start the heel. And yet I still find myself thinking about the Green Koigu. I may be a bit obsessed, folks, because I got a little spontaneous, snagged the green sock I had been knitting (in size 7/8), and took it downstairs to the ball winder where it promptly disappeared back into a ball of yarn. I will admit that all that needed to be done was graft the toe before I went and got freaky with the bal winder. Then I went searching through the stash until I found skein #2 and wound it into a ball. Both of them are sitting on the end table beside me, and I am feeling the urge to cast back on, this time in the larger size. If it just so happens that I don’t have enough yarn to finish, I’ll do something silly like make the toes a different colour. I can get away with that, right? Toes do go into shoes, after all. I turned the heel on yet another attempt at the green socks. Surprise! Really, this green vs. purple thing has got to end soon, but I’m not exactly sure how. Certainly not in a fight to the death or anything. 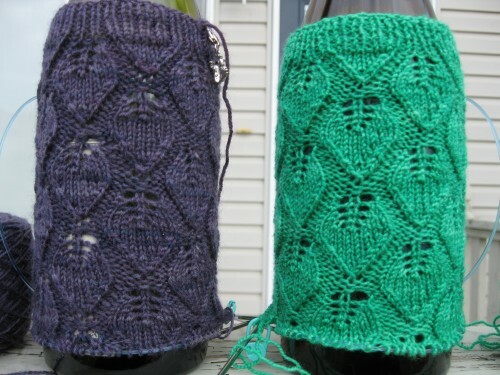 I’m thinking that I’ll probably finish both pairs for Yule or thereabouts. 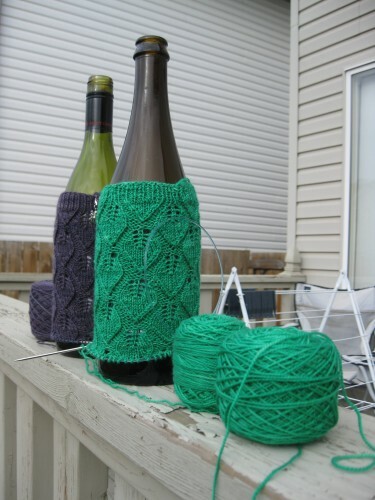 When I took pictures of the socks in progress this afternoon (both green & purple, using wine bottles to stretch out the patterns), I was at around the 2/3 to 1/2 mark on the ball of green. 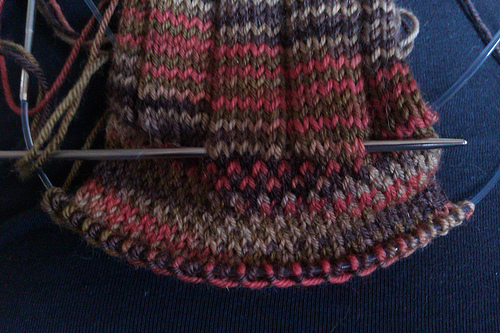 I’m now down around the 1/3 mark, and have about 2 or 3 inches before the toe decreases. Wish me luck! I can pretend this is the reason why I keep old wine bottles, right? 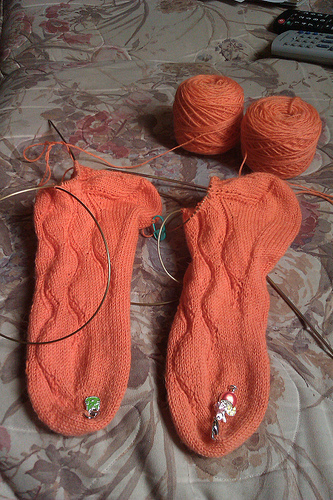 Sock #1 was finished on the 21st, I think, and now I’m working on the heel of #2. 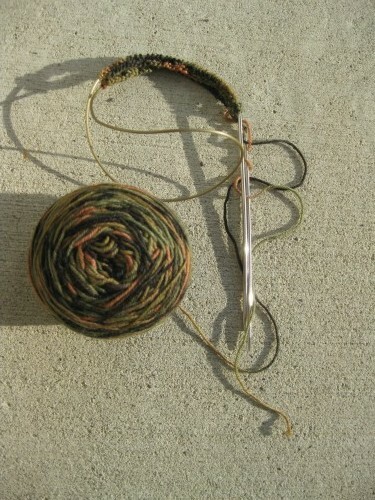 Pro-Tip here…when you get to the heel, transfer to a set of needles with a longer cable. My 42” needles are doing the job perfectly, because with the extra length I can divide the stitches in thirds rather than just over needles one and two. 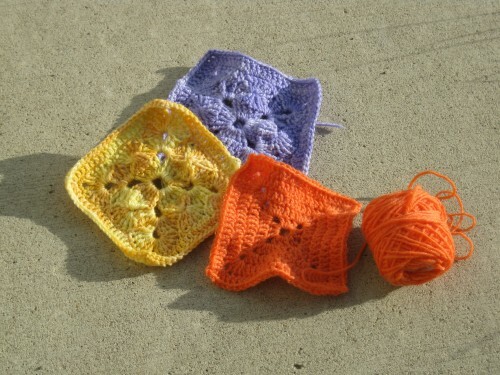 Sure, I could probably do these with DPNs, but as much as I like them, I prefer circulars. I’m a big girl. I can admit that. Finished! This project begs the question “how many times can you knit the same sock?” because after I finished sock #2 (around 6 or 7pm), I ripped back the toe of sock #1 and re-knit it a bit longer. There is so little yarn left over that it’s not registering on my little kitchen scale. I’m really just glad that I managed to complete the project with the Koigu, and I don’t feel any shame whatsoever in admitting that I’m keeping these beauties for myself. I still have the purple cuff on my other set of needles, and I do plan on completing those socks, so a pair may just go into my birthday/Xmas present collection box! I’ve gotten so used to having the same pair of socks constantly on the go, so I find myself automagically reaching for them when I sit down. I suspect they will be photographed soon enough! I will admit that the title is due to an offhand comment made at work this evening, and probably has nothing to do with the rest of the post. Hooray non-sequiteur? It's at about this point I think my neighbours were wondering why the crazy lady was taking pictures of her front walk. Beautiful northern lighting this AM! 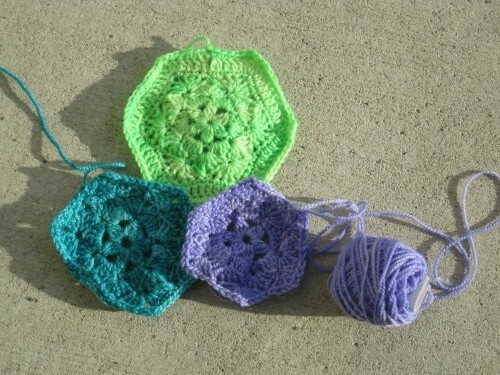 I played with some granny squares. I’m not addicted. Honest. I can stop anytime. And then we go back to the sock for a bit. Let me just say that I love socks. They’re my “thing”. You know, how everyone has something they’re good at? Mine is socks. Kinda a “Jack of all socks, Master of none”. And so I think what I’m going to do is get in-depth with it and put some effort towards building an online Ensocklopedia for those who either are new to the humble sock, or a little bit terrified of trying to knit a cylinder with a bend in the middle. I want to do a detailed sock anatomy, an exploration of toe-up and toe-down techniques, as well as common heel and toe methods. This could take awhile. But it looks like fun! We’ll see how it goes. I finished up the Catnip Socks this week. It didn’t take very long. They’re a great knit. Remember how I said I was going to frog back what I had done with the socks I’m designing? I did so. It hardly feels like it’s been almost two weeks since I started these. It feels like they’ve been going faster than lightning, but maybe that’s just because I’m doing them both at the same time and the colour is so happyshiny that I don’t necessarily want them to end. I poke holes in my socks. On purpose. Well, I obviously want them to end…but I think you know what I mean. They’re gorgeous, from the tips of the toes to the tops of the ankles. I’m working my way to the top of the cuff. I figure it won’t take much longer than a couple of hours to get the last inch of leg done, then a 2×2 rib cuff. But that’s OK. I have designwork to get to. I know that I’ve mentioned the mythical “designwork” previously, but each time I get halfway done a first-sock prototype, things focus a little more clearly in my mind. Part of the problem with design is that you have to weed out the great ideas from the not-so-great ideas. Sometimes the sock gets “cluttered” and you wind up with the elements of two or three socks trying to coexist in one place. I have to keep reminding myself that this is going to be a sock for a man who likes to wear out the toes and heels. It doesn’t need any fancy bells and whistles, it doesn’t need any attractive “features”. It needs to be functional and tasteful. My original idea, which was relatively plain to begin with, is ideal, particularly since I’m designing for a yarn that knits up fairly busily. I said the colour variation was busy, didn't I? Something tells me I’ll be spending a little time with my ball-winder. 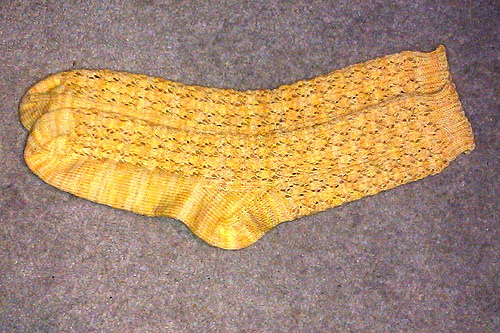 In the meantime….happyprettyyellowsocks! I think there’s a reason why Wendy Johnson named this particular pattern “Catnip”. 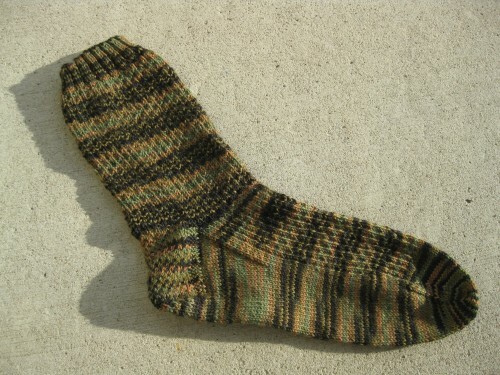 I went looking for the July 2011 sock pattern for the Skinflint Sock Club (no idea if anyone is still following along, but I’m putting the choices up anyhow, at least until I can get back to podcasting). I came across quite a few, but the standout for me was the Wendy Johnson Catnip Socks. The more I looked at them, the more I wanted to knit them. What’s worse? 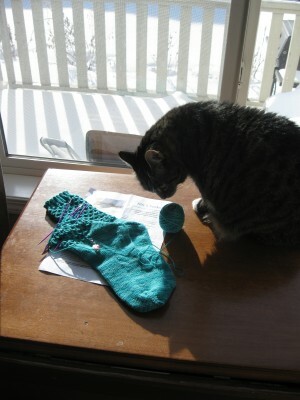 Since I was already done my June socks (Gush, by Yarnissima), I really wanted to cast on the Catnips as soon as possible. In the pretty new Dye Cauldron Yarn I bought from The Loop. I don’t like being sockless and I didn’t want to play with just another vanilla sock. I wanted these ones. Now! 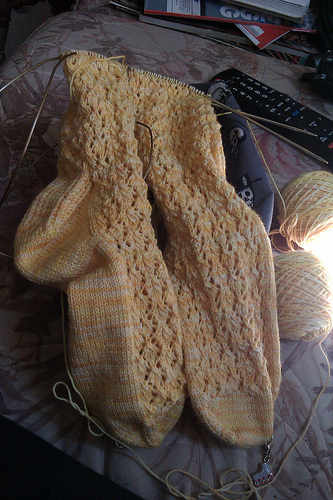 I’m almost to the gusset increases. The (not necessarily) trained eye will note that I’m doing these 2-at-a-time on one circular needle. I tried using two 32″ circs, but all the points just get in my way. Plus, the cords on my Addi Turbos are a little beat-up. I probably should be re-heating them in some water or considering replacing a couple of pairs. I saw mention somewhere that Knitpicks has some inexpensive nickel-plated 2.5mm circs, so they’re a definite possibility now that the postal strike is over. 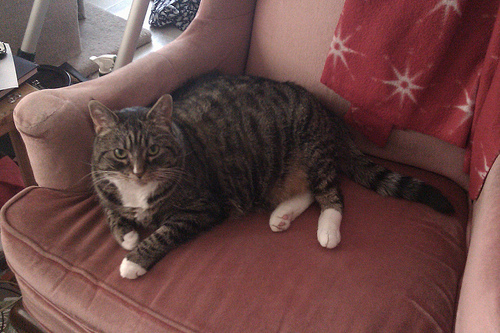 ...what do you mean, YOUR chair?? Also new this week? Ysolda Teague‘s Little Red in the City is shipped! I’m awaiting my hard copy with bated breath. I’m actually reading through the e-book version right now. I’m actually paying attention to the technical information rather than skimming, which is rare for me. She goes into a lot of good detail about fit, particularly for custom-fitting odd shapes, which I really appreciate. Having never been a “normal” size, I find that most designers just don’t understand what it’s like to want pretty clothing even if you’re beyond a size 15. I’m very glad that Ysolda decided to design for both size ranges. Once I have the physical book I will likely do more of a review. 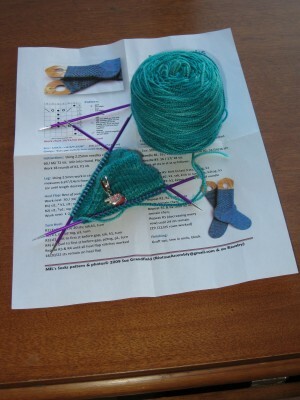 Working on the Gush socks (pattern by Yarnissima)…Starting on clue #4. I have to admit that while I was excited to get started, I’ll be happy to see the end of this pair. The yarn is a little *too* “wool-y” for this time of year, and the knit & purl pattern is somewhat fiddly. I’m finding that the pattern instructions in the chart are misleading…I have to keep flipping to the written instructions, which is extremely inconvenient. I’ve also had to wash my hands often due to the warmth of the day plus the warmth of the wool. Ugh. …almost literally, in fact, but we’ll get to that in a moment. That, there is part of my year-round self-sock-club. The blue socks are my February MIL’s Socks, the red pair are March’s Shur’tugal, the multicolours are the second pair of April socks (toe-up with an afterthought heel), and the really bright neon green socks are May’s Kaibashira. The main Green Eyed Monster April socks are down below, as they were in the wash when I took the picture above. So yes, it’s been quite awhile since my last post, and that means quite a lot of pairs of socks. I’ll offer brief apology, only to say that this year has been difficult. May is pretty much when things started to turn around and I felt like we were coming out of a long, dark tunnel. I’ve been feeling the urge to post more and more, and I’ll hopefully be podcasting again shortly. I blame some of this on possible Seasonal Affectedness Disorder (Canadian winters beat the snot out of everyone, particularly when they’re as long as this year’s has been), part on possible mood disorders that I’m too lazy and stubborn to get diagnosed, and diet. In fact, I blame a lot on diet. I’ve noticed that when I clean up my diet and stick to it, I feel so much better. Sugar, starch, grains….they do a real number on me, and once I start eating them I feel like I can’t stop. I’ll go on a grilled cheese binge, or feel the need to have a Dairy Queen Blizzard every few days. Then I get depressed, and go on a roller-coaster of unhappiness. I’ve been 90% low-carb for the past month or so. Weekends are a bit of a trial, as there is no real structure, but I’m working on it and every weekend gets better. I’m slowly losing weight…two steps forward, one back and all that, but progress is progress. I’ve even got a second pair of socks for May on the needles!